One of the best things that you can do for yourself is watching your weight. Though stepping on a bathroom scale can be a scary prospect, I do like to keep track of what I weigh. I found monitoring yourself at least once a week to see whether you gained can help make it easier managing that weight since those dreaded pounds can slip on before you know it. So when I had the opportunity to try out the EatSmart Precision Digital Bathroom Scale for this review and giveaway, I was thrilled to participate. My old-fashioned bathroom was far from accurate. Sometimes, I would be skinny and other times fat no matter how much you jiggled the little knob trying to line everything up before stepping on. Once I inserted the 4AAA batteries that came with this scale and placed it on a hard floor (not a carpet), I pushed down so the big digital number reading could be set before I weighed myself. It is automatically calibrated so it was ready to go after I took care of that initial step. Immediately that big 3.5 digital screen came to life and signaled that it was time for me to step on that sleek glass top of the 12″ x 13″ platform and weigh in. Let me tell you that this scale that has four precision sensors is very accurate even after several attempts. Unfortunately, I am now a little fatter on this new scale, which I blame on jogging pants with their elastic waist that allows you to eat more compared to tight jeans. Nonetheless, I have been writing down my weight and will be cutting back on the calories since this latest reading until I get a little thinner. 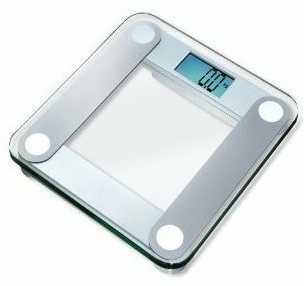 Seriously, I think if you’re looking for a great and affordable bathroom scale, do pick up this EatSmart scale because it does give a true reading. This way you’ll be able to correct a smaller weight problem before it becomes harder to deal with. Every month EatSmart donates a portion of their sales to charity. Thanks to EatSmart Products, one lucky Nuts 4 Stuff reader in the United States wins the EatSmart Precision Digital Bathroom Scale ($49.95 value)! This giveaway ends February 16, 2012 at 12 PM Eastern Standard Time. The winner will need to respond to my email with name and shipping address within 48-hours or another winner will be picked. Previous Post Is Your Foundation Not Blending Properly? GFC. eclairre(at)Ymail(dot)comI like the retro kitchen scale. I like the EatSmart Precision Premium Digital Bathroom Scale. I would also like the EatSmart™ Precision GetFit Digital Body Fat Scale. I follow you as mary, magloro@gmail.comI'd like either one of the scales or the luggage scale. I learned that one of the scales will show your body fat. #1I follow eatsmart on twitter as @victoriachoman. #2I follow eatsmart on twitter as @victoriachoman. #1I joined EatSmart's Circle on Google Plus as Victoria Homan. #2I joined EatSmart's Circle on Google Plus as Victoria Homan. #1youtube lessonEatSmart Nutrition ScaleI learned that the scale can tell you how much sodium is in certain foods. #2youtube lessonEatSmart Nutrition ScaleI learned that the scale can tell you how much sodium is in certain foods. I also like the Eat Smart Precision Get Fit Digital Scale! thanks for hosting! GFC follower: Atreau.ATREAU at GMAIL dotcom. I would love the EatSmart™ Nutrition Pro Scale – Digital Food and Nutrient Calculator. I tweeted the requested message on Twitter at https://twitter.com/#!/likwan/status/170181361406189568. I also like the Get Fit digital scale. To know your body fat would be great.